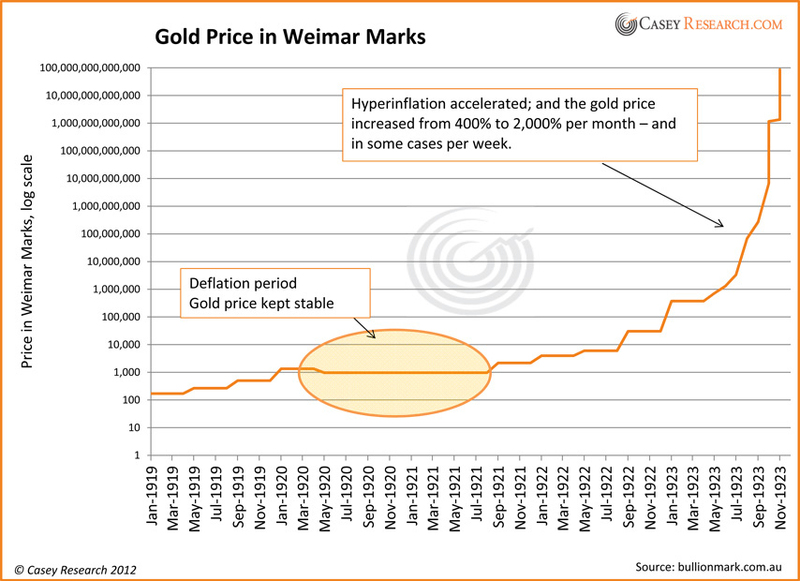 You are here: Home » Blog » Precious Metals » Gold » How Does Gold Fare During Hyperinflation? Inflation is a natural consequence of loose government monetary policy. If those policies get too loose, hyperinflation can occur. As gold investors, we’d like to know if the precious metals would keep pace in this extreme scenario. Hyperinflation is an extremely rapid period of inflation, but when does inflation (which can be manageable) cross the line and become out-of-control hyperinflation? Philip Cagan, one of the very first researchers of this phenomenon, defines hyperinflation as “an inflation rate of 50% or more in a single month,” something largely inconceivable to the average investor. While there can be multiple reasons for inflation, hyperinflation historically has one root cause: excessive money supply. Debts and deficits reach unsustainable levels, and politicians resort to diluting the currency to cover their expenses. A tipping point is reached, and investors lose confidence in the currency. “Confidence” is the key word here. Fiat money holds its purchasing power largely on the belief that it is stable and will preserve that power over time. Once this trust is broken, a flight from the currency ensues. In such scenarios, citizens spend the money as quickly as possible, typically buying tangible items in a desperate attempt to get rid of currency units before they lose value. This process increases the velocity of money, setting off a vicious cycle that destroys purchasing power faster and faster. How Did Gold Fare in the Most Famous Case of Hyperinflation? One can’t help but wonder how the people whose wealth evaporated in Germany during this time felt. In effect, they were robbed by the government – they were on the losing end of a massive transfer of wealth. Of course, there are two sides to the story, as those who held significant amounts of gold and silver were the recipients. Those who today argue that our obscene debt levels, runaway deficit spending, and money-printing schemes are sound strategies and believe they won’t lead to out-of-control inflation might want to rethink those beliefs. We’ve seen this movie before: it doesn’t have a happy ending. The historical record is clear on what happens when countries embark on fiscal and monetary paths today’s leading economies are embracing. If gold’s recent price performance is anything like the calm before Germany’s hyperinflationary storm, this is a time to be accumulating more gold. Keep in mind that hyperinflation is not a rare event. Since Weimar Germany, there have been 29 additional hyperinflations around the world, including those in Austria, Argentina, Greece, Mexico, Brazil, Taiwan, and Zimbabwe, to name a few. On average, that’s one every three years or so. While hyperinflation devastates those who experience it, there is a healing aspect to it. Since the responsibility for this type of disaster lies solely at the feet of government, there may be some Darwinian justice to the way hyperinflation purges the perverse fiscal and monetary imbalances from an economy. After the Weimar Republic hyperinflation, the second half of the 1920s was a strong period for Germany, with low inflation and steady growth. It’s no secret that many currencies around the world, including the US dollar, are choosing the path of inflation. If we were to slip into hyperinflation, there will be disastrous consequences for those unprepared. Given that the US dollar is the world’s reserve currency, the problems would spread to practically every country on earth. Hyperinflation will shake people’s confidence not only in the US dollar, but in the paper currency system as a whole. What will actually come to pass, we don’t know. What we do know is that the measures to cure hyperinflation include tying the currency to a hard asset or even replacing it with one. When creditability in fiat money dissipates, gold may be the only viable option left standing. Again, the investment implication is obvious: continue to accumulate gold. Another way to look at it is this: how many ounces do you need to cover your monthly expenses? In Weimar Germany, inflation rose uncomfortably for two years – and then pinched harder, spiraling into a destructive hyperinflation for another two. Consider what it would take to maintain your standard of living for a couple years instead of just a couple months. And don’t listen to any government’s ongoing pronouncements of confidence in the current system, along with the mainstream media’s noisy and frequently inaccurate portrayals of the gold market. (For example, these two headlines appeared on the same day: Gold Edges Lower as Worries over Europe Simmer; and Gold Settles Higher on Spanish Bailout Plans.) In a world awash in ignorance about real money, if not deliberate obfuscation, you have to study the relevant history, draw your own conclusions, and stick with them. This example shows how gold can perform during hyperinflation. If that worst-case scenario comes to pass, will the example your family’s finances sets be a positive or a negative one? Who Does Inflation Hurt Most? A caveat on the one root cause of Hyperinflation. Hyperinflation only occurs in countries where the government has already broken down. Weimar Germany was mired in a social Civil War (See FreiKorps. Spartacists, Bavarian Socialist Republic, Kpp-Luttwitz Putsch, assassination of Foregin Monister Rathenau), with a revolutionary government created post the abdication of the Kaiser, with no real history of capitalist democracy, and subject to being “invaded” (the Occupation of the Ruhr in 1923 post default) by foreign powers not to mention the infamous Beer Hall Putsch. Zimbabawe never had a working democratic government and the increasingly bizarre action of the Mugabe dictatorship, crashing the economy, divesting the (white) professional farmers of their lands and intervening in the First and Second Congo Wars, converted very high inflation to hyperinflation. Greece’s hyperinflation is coincident with the German Occupation of WWII when there was no legitimate local government. Every incident of hyperinflation or extremely high inflation recorded occurs within the context of a crisis in government. A crisis serious enough to put the survival of the government at risk.